Rishikesh is a sacred town on the banks of the Ganges. And the Ganges, as you probably know, is the most sacred of all rivers for Hindus. 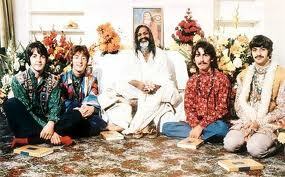 Rishikesh was made famous by The Beatles, who traveled there in 1968 at the height of their fame to meet with Maharishi Mahesh Yogi, who introduced them, (and through them the world,) to transcendental meditation. While there they also wrote The White album. Rishikesh also features prominently in Autobiography of a Yogi. Yogananda spent time there searching for a teacher. Latterly, the town has become synonymous in the west for being the place to learn yoga – principally the asanas, or postures. I’ve been to Rishikesh twice before – one memorable time in the winter, when fog shrouded the Ganges and the place took on a magical ethereal air. Driving in from the airport this morning, and coming into town, I was struck by the number of roadside signs advertising ashrams and yoga retreats and meditation classes. Jennifer and I checked into a hotel that made some of the grubbier albergues on the Camino look positively five star. 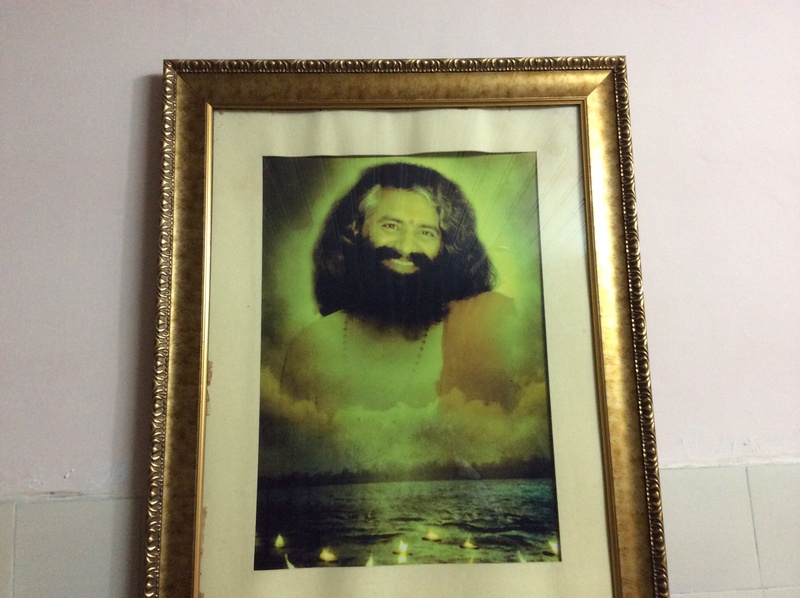 The head of the ashram is Pujya Swami Yogananda Ji – a man who’s revered as being a true spiritual leader. He’s been honoured throughout the world for his humanitarian achievements – not to mention his work in spreading yoga to the west. We went to reception and I boldly asked to see Swamiji. That’s like arriving at the Vatican and asking to see the Pope. But a volunteer assistant came out, and politely asked me who I was and why did I want to see Swamiji. 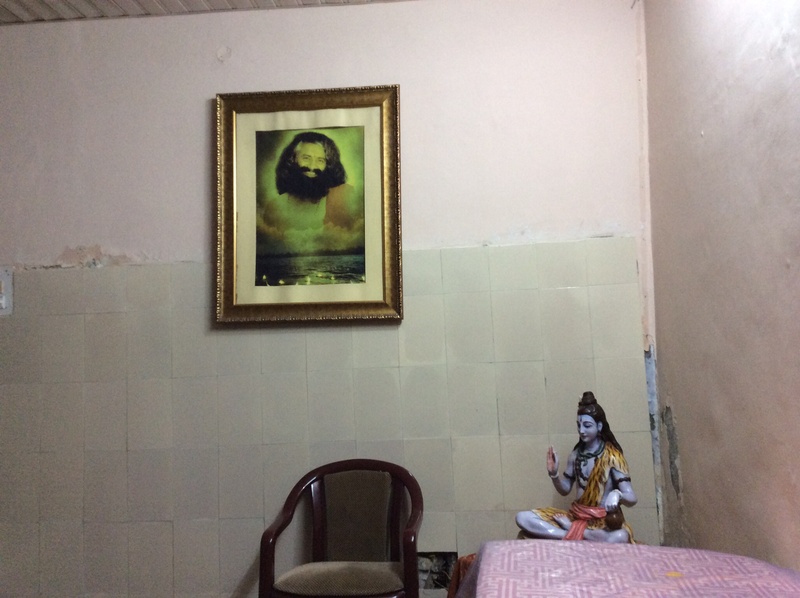 I told him about my film, and gave him a sketch of my background, and he went away – only to return not long later to say that Swamiji would see me, but only after the fire ceremony. The fire ceremony is held every evening as the sun goes down over the Ganges. 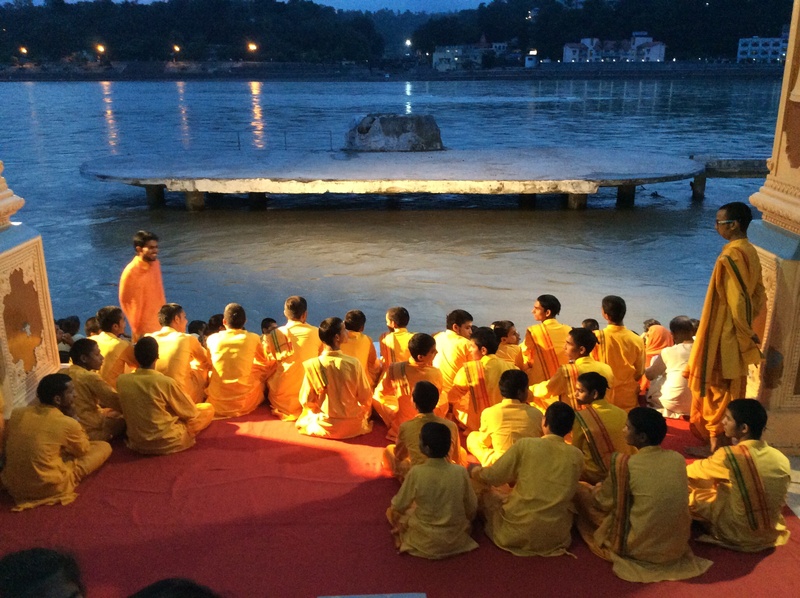 Hundreds of devotees, many in saffron robes, gather on concrete steps leading down to the holy river and begin to chant, accompanied by a group of musicians. After about half an hour, with the steps packed with worshippers and sightseers, the Swami arrived. Everyone stood reverentially, and he sat in amongst them and led a song – with everyone singing along and swaying to the music. I didn’t understand the words but the music, and the atmosphere, had a powerful affect on me. It loosened things up inside. In my head and in my heart. The swami himself exuded a majesty and power that was palpable. 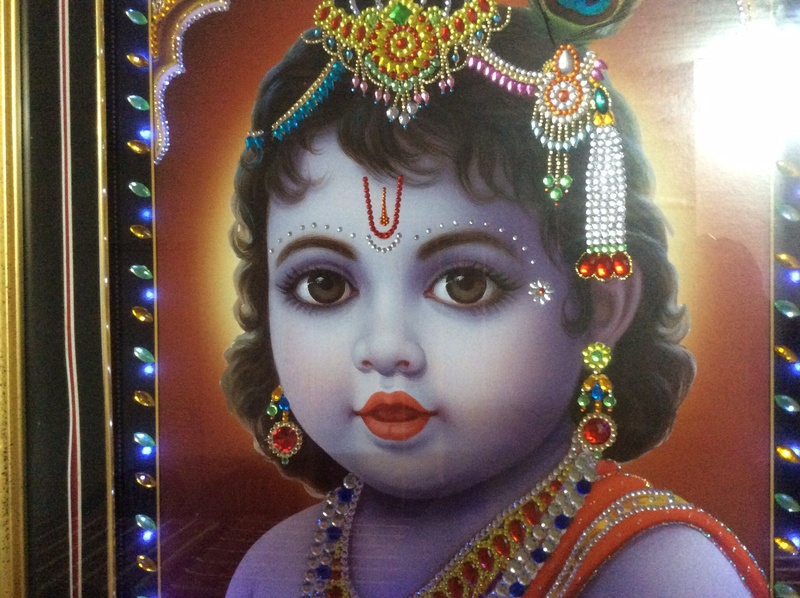 In any culture, in any situation, he would be regarded and revered as a holy man. 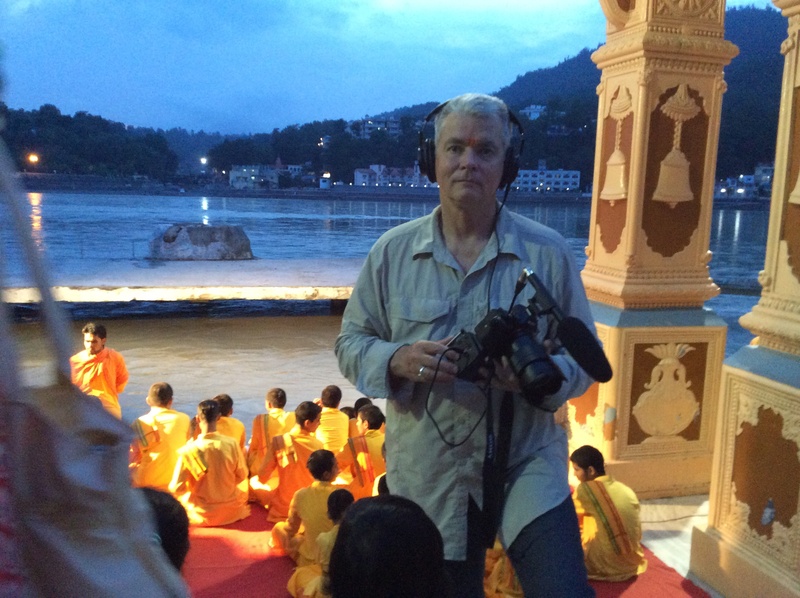 After the ceremony, the swami returned to the ashram, and I was told that I could meet him. We sat in a secluded area, him sitting ramrod straight with his legs folded in the lotus position, hidden under his robes – his eyes clear and sparkling and full of mirth and wisdom – his long curly locks of hair streaked with grey, his beard trailing down his chest. He asked me about the film, and I told him how a voice had saved my life, and how I wanted to find out what that voice was, and where it came from. He asked some questions, and agreed to me interviewing him in a couple of days. I was thrilled. He’s a wise man, and a holy man, and he’ll contribute significantly to the film. Afterwards Jennifer and I were invited to have dinner with one of the women who helps run the admin side of things – a vivacious American lass whose name is Sadhvi. She’s a psychology graduate who threw it all in eighteen years ago to join the ashram. She has a smile that could light up the entire ashram, plus she’s super smart and very articulate. She too has agreed to an interview. She left and we then got talking to some Americans who’d also attended the ceremony. 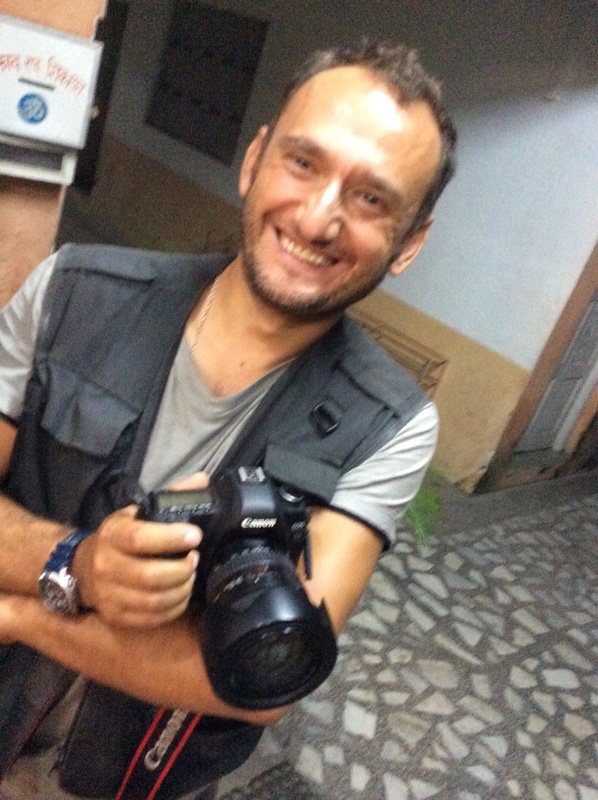 One of them had been shooting with a Canon 5D Mk II – and watching him shoot it quickly became obvious to me that he was a seasoned professional. I remarked on this, and he laughed and said that yes, before moving to American he’d worked for twenty years for the Vatican. For the past several weeks I’ve been trying to gain access to the Vatican – ideally to get an interview with the Pope, but even to get some formal Church view on intuition. We leave for Rome in less than two weeks to do this filming, and up till now we’ve not been able to get a definite decision on whether we have permission. And now this bloke turns up sitting across a table from me, telling me that he worked for the Vatican for twenty years, and he can get me that access. Perhaps not the Pope – that takes time – but certainly someone else high up on the food chain. Once again I was bowled over. When I need something on this film, it presents itself. I keep playing by the rules – that I will be led intuitively – and I keep on being led to the right people at the right time. Today was extraordinary – meeting the Swami, and simply being on the banks of the Ganges in amongst the very moving ceremony. And then later sitting with Swamiji in the ashram, and feeling an overwhelming sense of calm and stillness. Each day this film opens me up more and more. Well, Mate, can’t wait to hear where your pgs takes you tomorrow. But to Dallas? Wonder of wonders? Are you sure Houston is not just as close to your epicenter, globally speaking, of course? Haha – Steve, he said Dallas. So Dallas it is, on nov 23rd, in a cheap motel! Hey Julie, don’t have time now, but I’ve been thinking about it, yes! You do not need to go to the Vatican to ask the Pope about “intuition”. One of the wonderful things about the Catholic Faith is that everything can be found in her documents. Hi Kathleen – thank you for this. If there’s anything else that you can send me, I’d be most grateful – in particular anything historically regarding the church “banning” intuition or acceptance of the notion of a third eye. Hi Bill – I hope you found the article interesting. The Catholic Church would never ban “intuition” as such – innocuous in itself – but as Her aim is solely to help people on their journey to Heaven, or i.e. to save their souls, anything that might be an opening for the Evil One (the Devil) to get ‘a foot in the door’ so to speak, should be avoided like the plague. The Catholic Church, like any loving mother, will chide, advise and encourage, but only ‘bans’ those things that are clearly sinful, and thus harmful. I had never heard of “a third eye”, but I have googled it and I can tell you that this pagan type of belief has no place in Christianity. Having said that, the Church most certainly believes in mystic experiences, and prayers of meditation and contemplation, but always through Our Lord Jesus Christ, and using the trustworthy guidelines of the Catholic Church to prevent being deceived. St. Peter warns us: “Be alert and of sober mind. Your enemy the devil prowls around like a roaring lion looking for someone to devour” (1 Peter 5:8). God bless you Bill. I’m glad you are having a good trip. Thanks Kathleen – interesting that the Church would regard the Third Eye as pagan – it’s a critical part of Hindu and Buddhist and Tao religions. An essential part of their chakra system. I thank you for your help with this. Please send me anything else that might be helpful in understanding Christianity’s views on intuition – in particular the Holy Spirit and any iconography associated with it. Sorry to have taken so long to get back to you on this thread; I’ve been away a few days. Besides, this article got quite buried with all the other ones coming after it, and it takes ages to download your blog on my computer because of all the pictures! Discernment is a very important part of our lives. It is the way, through prayer and a well-informed conscience, we decide the paths God may be leading us down in life. Even when we make wrong choices (in our discernment) through temptation (for sinful things) or the bad advice of misguided fellow pilgrims through life, we are never abandoned… i.e. there is always a way to drag ourselves back, though this will often require a big dose of self-discipline and sacrifice. If you were to read some of the great Fathers of the Faith, early Doctors of the Church, e.g. St. John Chrysostom, St. Augustine, St. Irenaeus, I think you would see what I was getting at. Glad your trip to India was such a great success.